The multiples that are being placed on the large cap Industrial group are well above normal valuations and reflect the hope of a sustained synchronous global economic recovery driving very high incremental margins. 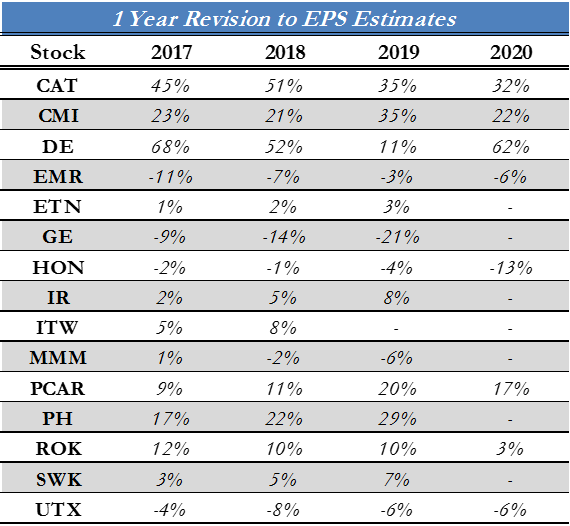 Earnings revisions trends have been favorable for many (such as ROK) and have supported stock prices above consensus targets. 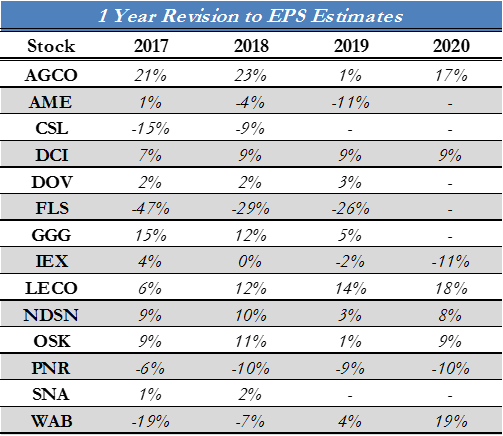 But for others (such as MMM and EMR) the elevated stock price has not been coincident with rising earnings estimates. The recent upgrade of CAT, pushing the stock to an all-time high, may be remembered as the relative high for the group. Note that the last time CAT hit an all-time high – close to current prices – earnings expectations were more than 50% higher than today. On the value side GE and UTX are the only two stocks that stand out, both have problems and we have written recently about the specific risks within GE. 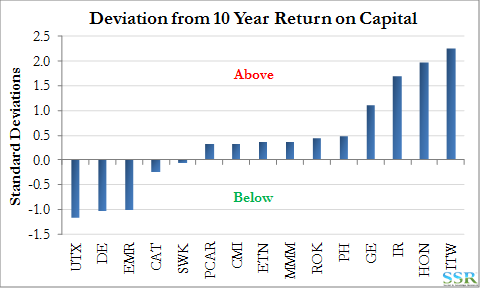 CAT looks expensive relative to current returns and estimates but not relative to history, though with increased competition from China, especially outside the US, it is possible that history is the wrong guide here. In the mid-cap group, the momentum plays are SNA (Hurricane momentum), CSL, NDSN and OSK (increased defense spending). IEX looks expensive and only has limited earnings momentum – so appears most over-valued, with GGG not far behind. “Expensive” stocks with earnings momentum support are harder to find in the mid-cap arena – suggesting vulnerability in all the names to the left in the second chart in Exhibit 1. 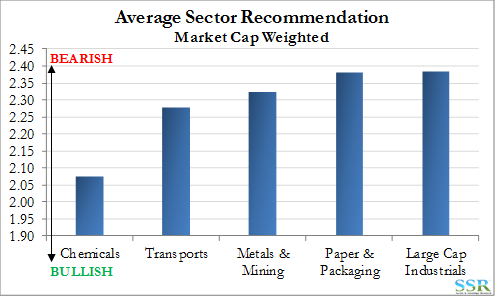 While we cover all of the Industrials and Materials universe, we tend not to write much on large or mid-cap Industrials. It is mostly because we cannot find any really good ideas. SWK has been a steady performer for us, but we aim to find ideas that have a thematic backbone to them and a significant valuation gap versus that theme. 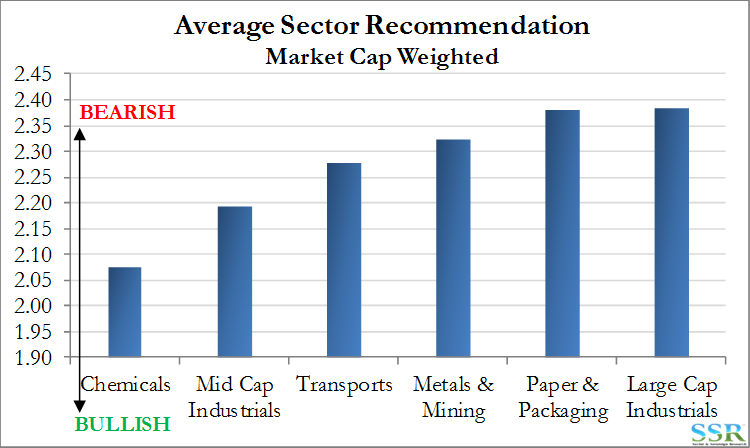 This is not the case for large cap industrials and has not been the case for a while. Most of our conversations with clients focus on the lack of opportunity in the sector – you are either buying companies that are at or close to all time valuation highs, in the hope that they go higher, or you are buying misfits, such as UTX and GE, in the hope that they finally get something right. For a group of companies exposed to manufacturing/industrial growth almost exclusively (MMM being the exception), the companies have done almost too well and this is reflected in sell-side sentiment, which is more cautious (albeit incrementally) than other segments within I&M – Exhibit 2. Our large cap industrials group (which forms the index in Exhibit 2), is the group in the left chart of Exhibit 1 and spans Capital Goods, Electrical Equipment, and Conglomerates. The laggards are the earnings laggards – GE and UTX for a variety of reasons – and CAT and DE because of fundamental end-market slowdowns, though both of these names are running well ahead of their current fundamentals and the share prices discount a fair amount of “expectation”. 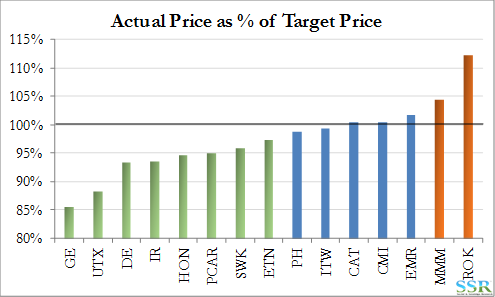 Given that the sell-side generally has a bullish bias and given how well some of the names in the group have done, the less positive stance is a function of how expensive many companies now look – ROK is more than 12% above the current average sell-side target, MMM is trading 5% higher than the consensus target price, EMR is higher, ITW and CAT are at their target, PH is almost at its target price, CMI also – Exhibit 3. 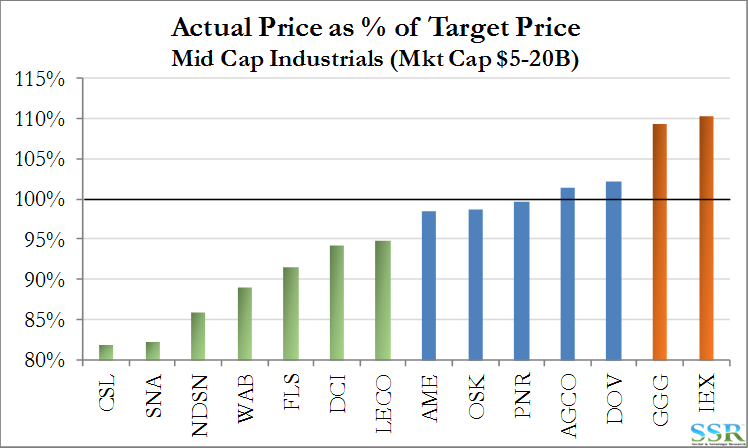 The mid-cap segment is less out of favor from a recommendation perspective – Exhibit 4 – but in terms of upside to target price the group looks very much like the large cap group – Exhibit 5 – suggesting even less alignment between recommendations and target prices than for the larger cap group. 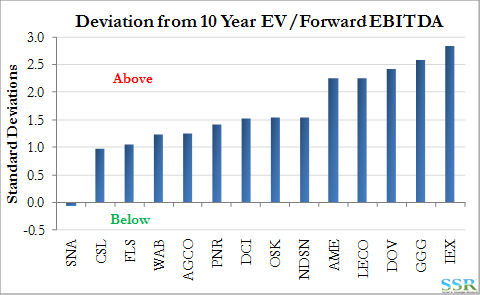 In this group IEX looks the most stretched (we have been negative here based on valuation for a while – and have been wrong so far) and OSK, NDSN and CSL probably the most interesting on the long side when comparing valuation with the data below. 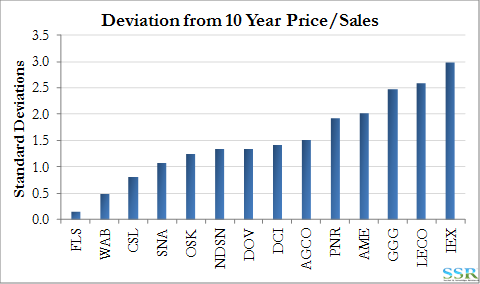 If we try to summarize the valuation data – discussed below – with the earnings and returns data, we get the following summary for the large cap group – Exhibit 6 and for the mid-cap group – Exhibit 7. 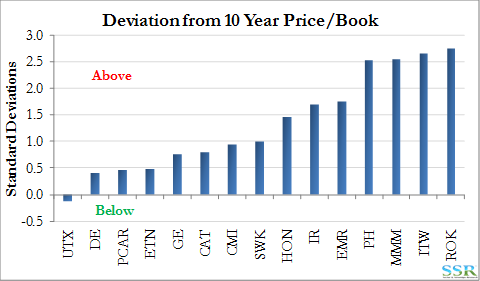 Valuations for CAT and DE are supported by revisions but not by earnings and both look expensive. Valuation for MMM is not supported by anything. HON and ITW are supported by returns, but HON not supported by revisions. 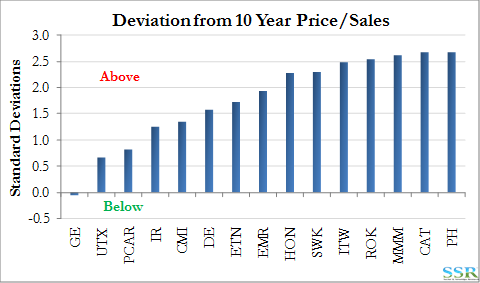 In the Large Cap space we think that ROK, PH, ITW and possibly IR, have the momentum to support valuation – GE is the obvious “value” play, but both UTX and PCAR look interesting. 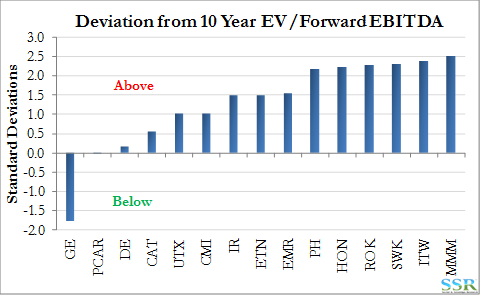 MMM, EMR and HON look much less well supported and therefore more risky. 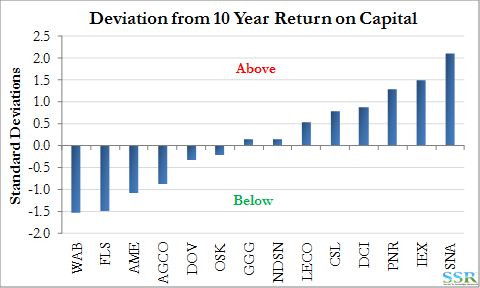 In mid-Cap, SNA has the returns that more than support valuation but does not have the revisions (yet); we think these many come with a boost from the hurricane damage. PNR could also see some positive revisions and OSK looks interesting from both an infrastructure and defense perspective. IEX looks very over-priced, as does GGG, both have some, but not enough support for current pricing. 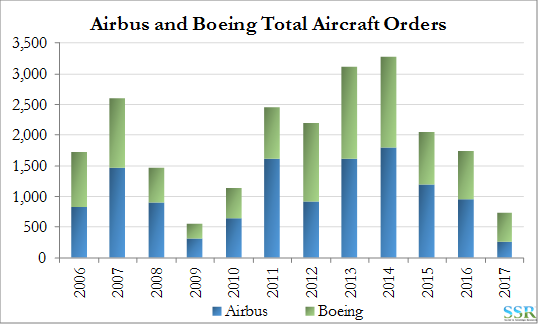 Aerospace: Aircraft OEM orders are falling but the backlog remains very high – production rates have plateaued – but should remain at high levels for several years – Exhibit 8. Autos: while auto OEM sales may be past their peak in the West (adjusting for the one-time impact of the hurricane damages), auto makers are launching new models at a higher rate – in part to meet CAFE standards – which should keep demand for factory equipment high. 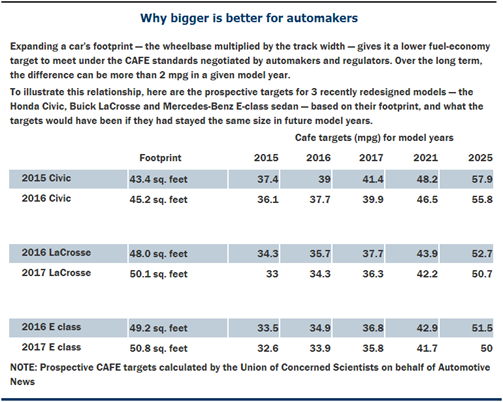 Car makers are changing vehicle footprints in order to reduce the severity of fuel efficiency targets – as shown in Exhibit 9. This sort of model change requires new manufacturing equipment and controls, even if the model look and feel does not change much. However, improving the look, feel and the electronics is a key selling point today and we expect more than just minor upgrades to production lines as models are updated. There is another truck emissions standard in the US beginning in 2018 which should keep demand high for the truck engine makers. There is also likely to be a replacement step up from the vehicles damaged in the hurricanes. This could give earnings support to PCAR, which looks much cheaper than CMI. Construction is improving – helped by the hurricane recovery work and teased by the potential for a US infrastructure bill – now probably not this year, but maybe next. Defense looks ok. Some positive for HON and GE, but OSK probably the smarter way to play any increase in spending from here, given OSK exposure to other business such as cement trucks. Agriculture still weak in our view – and while the data supports some recovery in machinery sales – Exhibit 10 – crops remain in oversupply and farm incomes weak, which we think keeps the market unexciting for a while. 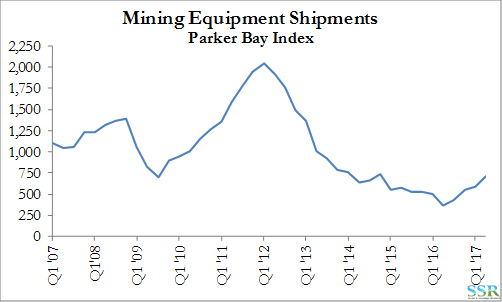 Mining, less weak than it was, but a long way away from peak – Exhibit 11. 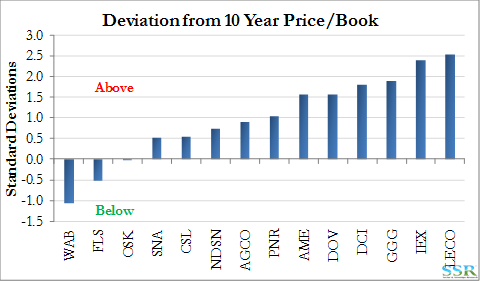 So many stocks in this group are trading at statistically significant premiums to history – Exhibits 14, 15, and 16 and while some have the return on capital and earnings support for the premium valuations – others do not – Exhibit 17.